Studio Line: MGM - Nice guys finish last. Meet the winners. One's got a sophisticated, suave and debonair con act. The other's got…well, an act. Together, Steve Martin and Michael Caine are Dirty Rotten Scoundrels, and they're absolutely ruining the Riviera in this "hilarious battle of wits and double-crosses" (Boxoffice) that "couldn't be more delightful" (The Wall Street Journal)! Martin is Freddy Benson, a small-time con mansleazing his way through Europe on whatever handouts he can scam. Caine is Lawrence Jamieson, an impeccably dressed and high-minded artiste who thinks Freddy is giving him -- and all con men -- a bad name. At first, Lawrence agrees to help Freddy spruce up his talents and his wardrobe. But when it becomes apparent that the Riviera isn't big enough for the both of them, they make a winner-take-all wager over the fortunes of a naïve American soap heiress (Glenne Headly): The first one to "clean her out" can make the other clear out -- and keep the Riviera and its unsuspecting tourists to himself! DVD: Widescreen 1.85:1/16X9; audio English Dolby Digital 5.1, French Stereo Surround, Spanish Stereo Surround; subtitles English, French, Spanish, Portuguese; closed-captioned; single sided - double layered; 16 chapters; rated PG; 110 min. ; $19.95; 12/4/01. Supplements: Audio Commentary with Director Frank Oz; Behind-the-Scenes Featurette; Teaser Trailer With or Without Director Commentary; Theatrical Trailer. Back when he made Dirty Rotten Scoundrels in 1988, Frank Oz was best known as the voice of Miss Piggy and Yoda. Actually, he’s still best known for his puppet work, but in spite of that, he’s gone on to become a fairly successful director. Scoundrels wasn’t his first film, and I don’t think I can claim that it put him on the map as a director. Actually, I’m not sure Oz has been successful enough behind the camera to actually be on any sort of map. He’s helmed some modest hits but nothing that really tore up the box office, and Scoundrels neatly fits that mold. Even if Scoundrels wasn’t a box office smash, it was a fine film, and it performed reasonably well in its era. Along with 1999’s Bowfinger, it stands as one of Oz’s two best flicks. Is it a coincidence that Oz worked with Steve Martin in both of those movies? Probably not, though I don’t want to attribute all of Oz’s success with those pictures as being due solely to casting. Perhaps Martin just brings out the best in the director. In any case, Scoundrels feels something like a companion piece to Bowfinger, since Martin plays a scheming character in both of them. However, that’s pretty much where comparisons to the lovable loser Bowfinger and the cynical con man Freddy Benson end. Bowfinger includes no character who seems analogous to the other main participant of Scoundrels, the more genteel and sophisticated swindler Lawrence Jamieson (Michael Caine). Scoundrels remakes 1964’s Bedtime Story, which starred David Niven in the Caine role and Marlon Brando (!) in the Martin part. At the start of the film, we see Lawrence in action near his swank French villa in Beaumont Sur Mer. Aided by local police inspector Andre (Anton Rodgers) and his butler Arthur (Ian McDiarmid, in between stints as the Emperor), Lawrence takes wealthy women for vast sums of money and seems to enjoy a rather rich and content lifestyle. However, storm clouds gather on the horizon when he learns of a notorious con artist known only as the Jackal. Lawrence thinks he’s met this match when he encounters Freddy on a train ride. Granted, Freddy seems like a small-time swindler, so Lawrence probably should have suspected something, but he goes on guard anyway, especially when Freddy declares his intentions to visit Beaumont Sur Mer. Despite Lawrence’s best efforts, the junior con man comes to the villa anyway. The town’s not big enough for the both of them, so the two need to find some way to establish territorial rights. They choose a bet and set their sights on the “US Soap Queen”, Janet Colgate (Glenne Headley). The first man to get $50,000 out of Janet wins. From there a series of comic escapades ensue as both Lawrence and do their unscrupulous best to separate the sweet and innocent Janet from a substantial piece of change. It’d be unfair of me to reveal more than that, for much of the fun found in Scoundrels results from its many twists and surprises. However, the pleasure doesn’t hinge on those factors, as I can attest; I’ve seen the movie four or five times and it remains very entertaining despite the lack of freshness to its plot. Still, anyone who hasn’t seen it deserves to go into it clean. Comedies live and die by their performers. Of course, script, direction and all the other filmmaking elements are important as well, but a good actor can turn a bland film into something wonderful, while it’s very difficult to overcome a drab presence in a comedy. Scoundrels went with an interesting approach for its three leads. Only Martin was an established comedic actor, and this era represented his most successful work. During the second half of the Eighties, he knocked out hits like Planes, Trains and Automobiles, Roxanne and Parenthood as he slowly became more famous as an actor than as a stand-up comic. In Caine, obviously we got a highly successful and well-respected actor. In fact, he’d just won his first Oscar for Hannah and Her Sisters. However, Caine wasn’t - and still isn’t - well known as a comedic presence, so he was more of a wild card in that regard. Not as much as Headley, though, who was a virtual unknown with film audiences at the time. I’d certainly never heard of her, and though she never turned into a star, she at least developed a name for herself after Scoundrels. All three show fine timing and presence, and they work quite well together. Chemistry becomes very important because those three spend much of the film interacting with each other. In fact, once Freddy enters the scene, we rarely see any of them without at least of the others; they play off each other and develop much of the story through their revelations and reactions. In the end, Dirty Rotten Scoundrels remains a delight 13 years after it first hit movie screens. The movie shows few signs of age as it thrives due to the fine performances of its leads. It’s a solid comedy that seems winning and engaging from beginning to end. 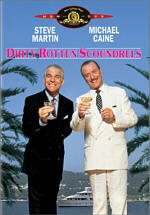 Dirty Rotten Scoundrels appears in an aspect ratio of approximately 1.85:1 on this single-sided, dual-layered DVD; the image has been enhanced for 16X9 televisions. Overall, the picture seemed reasonably good, but a smattering of problems made it look less than terrific. Sharpness appeared consistently solid. The movie always came across as nicely detailed and well defined, as I detected very few instances of soft or fuzzy images. Jagged edges and moiré effects caused no concerns, but I did detect some mild edge enhancement at times. Print flaws didn’t seem heavy, but they did crop up throughout much of the film. Light grain could be seen at times, and a few examples of nicks, streaks, and hairs also occurred. More frequent were the speckles and grit; these didn’t come across as pervasive, but they appeared more often than I’d like. Colors looked nicely rich and vibrant much of the time, as the French seaside setting offered many opportunities for vivid hues. Usually they seemed clear and distinct, but at times the tones appeared somewhat thick. Interiors showed the most problems, and skin tones could look somewhat reddish on occasion. Nonetheless, most of the time the colors were quite attractive. Black levels suffered from a few similar concerns, but nothing too significant. They usually seemed fairly deep and dense, and shadow detail looked appropriately clear and opaque for the most part. A few interiors came across as mildly murky, but overall, the low-light shots seemed fine. Ultimately, Dirty Rotten Scoundrels provided a decent but unexceptional visual presentation. The film’s Dolby Digital 5.1 soundtrack boasted fairly similar levels of quality. Not surprisingly, the mix remained pretty heavily oriented toward the forward channels. In the front, I heard very nice spread to both music and effects. The former showed good stereo separation and delineation, while the latter provided solid localization and panning. The elements blended together well to create a reasonably vivid and lively setting. For example, the atmosphere came to life neatly during the train and casino sequences. Surround usage seemed limited, as the rears offered little more than general reinforcement of the effects and music. However, this wasn’t a complaint, as the surrounds appeared to work appropriately for this kind of flick, especially given its age. Audio quality was good as well. Speech seemed a little thick at times, but for the most part dialogue came across as acceptably natural and distinct, and I detected not problems related to intelligibility or edginess. Effects were a fairly minor aspect of the mix, but they consistently appeared clear and accurate, and I heard no significant signs of distortion. Music showed reasonable clarity and brightness but suffered from some mildly drab tones. Except for the disco scene, bass response seemed limited; the dance sequence showed nice depth, but otherwise the score sounded somewhat restricted and flat. Nonetheless, I found Dirty Rotten Scoundrels to provide a perfectly fine soundtrack for a film of this vintage and genre. Although not packed with special features, Dirty Rotten Scoundrels includes a few nice pieces, starting with an audio commentary from director Frank Oz. He offers a running, screen-specific affair that took me by surprise. From what I know, this is Oz’s fourth commentary; he also provided tracks for Bowfinger, Little Shop of Horrors, and The Indian in the Cupboard. I’d only heard the commentary for Bowfinger, and I found it to be a very dull affair; my review referred to it as “disappointingly dry and often tedious”. As such, I expected little from his remarks for Scoundrels, but I was very pleasantly surprised at the results. During this track, Oz offered a consistently warm and engaging presence, and he almost never stopped talking about his film. While he definitely told us how great the cast and crew were, this tendency didn’t degenerate into banal happy talk; Oz seemed genuinely pleased to watch the movie again, and he really seemed to like it. That attitude carried the day to a degree, but the high level of useful information he provided did the real trick. Oz covered a wide array of topics, from location scouting to editorial techniques to set decoration to his comedy philosophies to working on the script to… well, to an awful lot of subjects. Oz provided an entertaining and compelling track that was a consistent delight. A few other bits round out the disc. First up is a six-minute and 45-second Behind the Scenes Featurette. It combined movie clips, shots from the set, and interviews with director Oz, writer/executive producer Dale Launer, director of photography Michael Bollhaus, producer Bernard Williams, costume designer Marit Allen as well as actors Headley, Caine and Martin; the latter two were filmed together. Due to its length, the featurette couldn’t provide great depth, but it was a decent little overview of the production. At least we heard from a number of different sides of the film and not just the usual mix of director and actor statements. Actually, the program’s best parts came from the some of the interchange between Martin and Caine, as they offered a few funny moments. Ultimately, this wasn’t a great piece, but it was above average for its genre. In addition, we find both the film’s theatrical trailer and its teaser trailer. The latter’s unusual because it was shot specifically for the ad; none of the material appeared in the movie itself. Interestingly, Oz provided a commentary for the teaser as well as the full flick. He told us a little about it and gave us a bit of useful information. A gently wicked but thoroughly engaging comedy about some unscrupulous people, Dirty Rotten Scoundrels provides a very fun experience. Mainly due to some wonderful performances, the film seems consistently delightful and smart, as it casts a clever and often hilarious web. The DVD offers good but unspectacular picture and sound as well as a modest roster of supplements. With a list price of less than $20, Dirty Rotten Scoundrels is a steal, though fans are encouraged to ignore the lead of its characters; don’t actually steal it, please!